I had a bag of grapes today while I was driving around Hollywood and I accidentally spilled half of them under the passenger seat. It was pretty hot outside and I like grapes, but I really like raisins so I just left them there. I’ll return to them at a more convenient time, when they’re ready to be neatly packaged in an individual serving size cardboard box. The closest thing MMA has to a sumo wrestler is Roy Nelson, and the guy has manifested into some bizarre hipster kung-fu artist now. He’s just a very rotund dude. I don’t think anyone that size is ever offended by being called ‘rotund’ It’s probably a rite of passage — like tribal children sticking their hands in an ant pile to prove if they are a man. There’s also another rotund guy that goes by the name of Byamba. 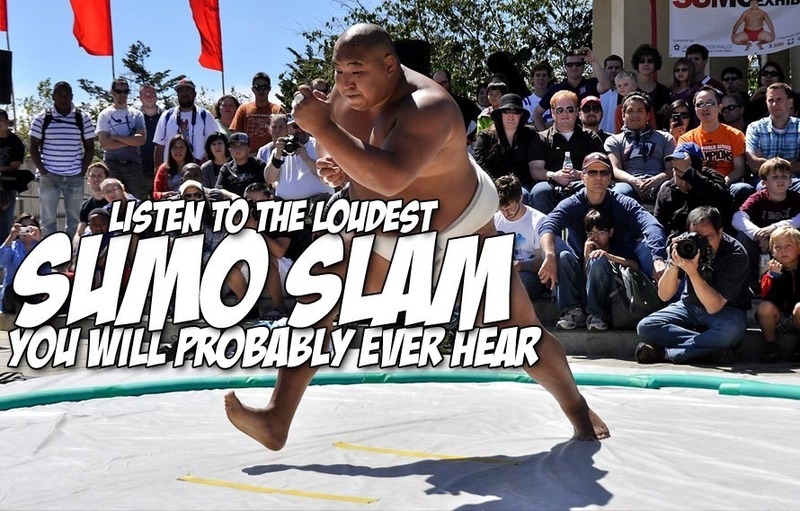 The guy is like a demigod in the Japanese sumo wrestling circuit — heck he even did an AMA on Reddit. Byamba has been living in Los Angeles since 2006 and he’s been steadily collecting an ample supply of sumo wrestling championships in the process. Yesterday the 13th annual 2013 US Sumo Wrestling Championships were held in Los Angeles and Byamba slammed his highly enlarged opponent like he threw his Xbox controller in disgust after getting killed in Call of Duty. Check it out.